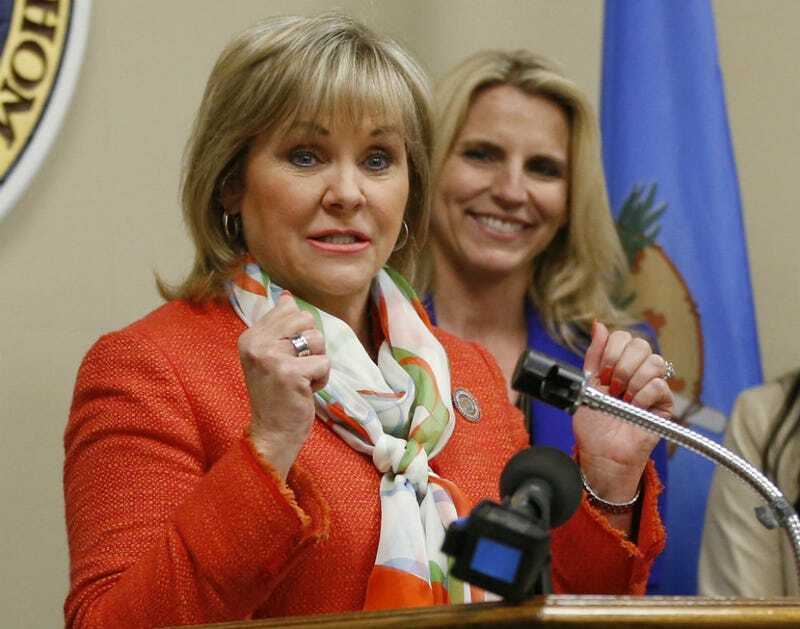 Oklahoma Governor Mary Fallin signed a ban late Monday on intact dilation and evacuation, a common second trimester abortion procedure. D&E is also commonly used in incomplete miscarriages, but the bill’s language around that is vague enough that it’s not entirely clear whether or not those are now off the table, too. Kansas banned the procedure last week. This is the new wave of the attack on abortion rights, and it’s going to be happen very, very quickly. “Dismemberment abortion” means, with the purpose of causing the death of an unborn child, purposely to dismember a living unborn child and extract him or her one piece at a time from the uterus through use of clamps, grasping forceps, tongs, scissors or similar instruments that, through the convergence of two rigid levers, slice, crush, and/or grasp a portion of the unborn child’s body to cut or rip it off. This definition does not include an abortion which uses suction to dismember the body of the developing unborn child by sucking fetal parts into a collection container. The bill doesn’t specifically make an exception for women having a miscarriage, but it does say an abortion can’t be defined as the removal of “a dead unborn child.” That should theoretically mean D&Es are still acceptable in the case of miscarriage, but the language here is uncomfortably broad. Like Kansas, the Oklahoma law only makes an exception for health risks so serious it would kill the woman, or would cause “substantial and irreversible physical impairment of a major bodily function, not including psychological or emotional conditions.” Both bills were based off model legislation written by the National Right to Life Committee; earlier this year, anti-abortion website LifeNews promised the new laws would “transform the landscape of abortion policy in the United States.” Like Governor Brownback in Kansas, Governor Fallin signed the bill quietly, without a public ceremony or even a press release. In their own press release sent out this morning, the Center for Reproductive Rights decried Oklahoma’s decision. Senate Bill 95 represents unwarranted intrusion in the doctor-patient relationship. The bill would restrict the safest and most expeditious way to terminate a second-trimester pregnancy. In many cases, these terminations are necessary for the patient to protect her health or future fertility, and the bill lacks an adequate health exception that would allow physicians to exercise their medical judgment in these circumstances. This legislation could also force physicians to provide substandard care to second-trimester abortion patients. Substandard care seems to be the point here, really. The law is set to take effect November 1. Correction: An earlier version of this post incorrectly identified Brunk as an Oklahoma representative and said the letters were sent from Oklahoma physicians. The corrected version appears above. I regret the error.